There are many great cafés in Brussels, but the main criteria for this post is that they must have free Wi-Fi and be comfortable enough to work in. 1. Karsmakers is my favourite. Set in the shadow of the European Parliament, this is the closest Brussels has to a real American coffee shop - check out their bagel of the month. Wi-Fi is unavailable at lunchtime but you can kick back on the couches and surf the web during the rest of the day. 2. Coming a close second to Karsmakers is Exki on Place Luxembourg. The main advantage is that Exki is open until 9pm whereas Karsmakers closes at 7pm. 3. Chez Franz is just a stone's throw from our office so we do not need much encouragement to hang out there. Their hot chocolate comes as hot milk and a little glass of chocolate chips to mix in. Heavenly! It reminds me of Café Charlot, one of my favourite Parisian hangouts. 4. Exki at Madou is a little slice of España as it is close to the Spanish Embassy and the offices of many Spanish companies. Many customers speak to each other in Spanish and you can usually find newspapers in español inside. 5. And last but not least, here at Sustainability Consult we offer informal hotdesking, Wi-Fi, tea and coffee and the Sustainability Consult juice bar to our friends and partners. Just stop by and see us. What are your favourite cafés to work from? 1. Exki are good and have a high sustainability profile. But two rankings?? 2. Don't you guys ever get out of the European quarter? 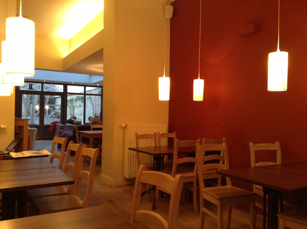 There are many good wi-fi cafes downtown,in Ixelles or Saint Gilles (links to follow). I think Exki could do a lot more on their waste as everything seems to get thrown away together. I guess the reason we use cafes in the European quarter is precisely because we have time to kill between meetings. We don't use that many cafes in Ixelles because we have a lovely office! We look forward to your list of downtown, Ixelles and St Gilles cafes! would you mind to take a look and possible review a new Coffee house Bocca Moka located near to Av.Louise? They have so varied coffee menu and lovely warm atmosphere. Would be interesting to read your opinion as they tried to recreate NYC style coffeehouse. And they have free wifi! Hi Alfiya, one of the team has been to Bocca Moka and can confirm it is also a nice place to work from, although there are not many tables, so it can get busy around lunchtime!